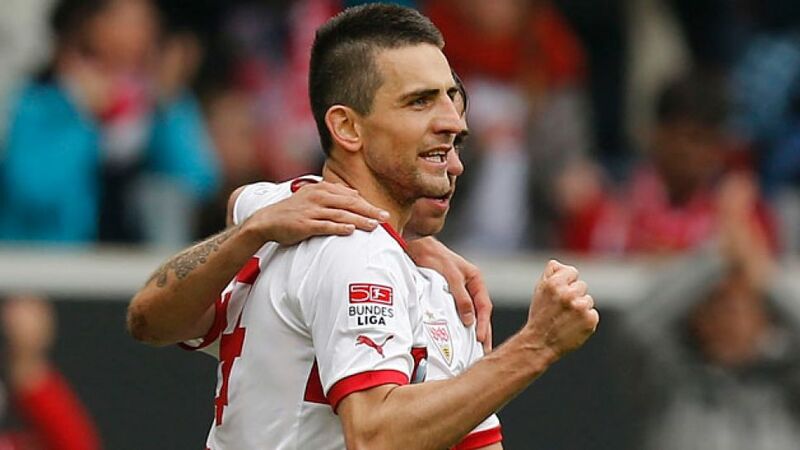 Stuttgart - VfB Stuttgart beat SC Freiburg for the second time inside the space of five days to further dent their south-western rivals' European aspirations, chalking up a 2-1 win at the Mercedes-Benz-Arena on Sunday afternoon. First-half goals from Christian Gentner and Vedad Ibisevic wrapped up the points for the improving hosts, who advanced to the final of the DFB Cup at the expense of Christian Streich's team at the same venue and by the same score on Wednesday evening. Substitute Ivan Santini's 88th-minute strike was too little, too late for the visitors, who passed up the opportunity to move above FC Schalke 04 and into fourth place. For their part, VfB move up into a solid mid-table position, their flirtation with the relegation zone a fast-receding memory. Stuttgart, with the same starting XI which successfully negotiated both the cup showdown and last weekend's home win against Mönchengladbach, pressed up the pitch purposefully in the opening minutes, but it was Freiburg who had an early half-chance on the break, Jonathan Schmid's final ball into the box finding no takers. Both sides were giving it their all in an engaging opening spell and just shy of the quarter-hour mark Gentner and Alexandru Maxim combined well, only for the skipper to fire his Romanian team-mate's return ball over the bar. Not long after that, another lightning-fast counter-attack by the guests ended with Max Kruse's fierce drive pulling a good save out of Sven Ulreich. On 20 minutes, the VfB custodian was picking the ball out the back of his net, but only to take a kick-out, Cedric Makiadi's point-blank header following a corner having been correctly ruled offside. The breakthrough, when it came, was at the other end. With 33 minutes on the clock, Martin Harnik made the most of the space he found himself in out wide to plant an inch-perfect cross into the path of Gentner, who headed home past guest keeper Oliver Baumann for his fifth goal of the campaign. And it was to get even better for the hosts three minutes before the break. Harnik robbed Julian Schuster of possession and his delivery this time found Ibisevic with time and space in the box to slip number two past Baumann - the Bosnian international's first open-play goal of 2013. Immediately after the restart, Harnik missed the chance to put the contest beyond doubt, snapping up another loose pass and running through one-on-one against Baumann, only for the SCF stopper to keep his side in it with a fine save. In the exchanges that followed Freiburg were seeing plenty of the ball, but it was the home side who continued to look more dangerous in possession. As the second half matured, Makiadi had back-to-back chances to throw the visitors a lifeline, first just failing to connect with a high ball in from the left, then drilling a low shot narrowly wide from a few metres out. After that, however, it was Stuttgart who came closer to adding to their own tally, Ibrahima Traore hitting the post with an 85th-minute cross-shot. With the clock ticking down fast, Santini ensured a tense ending by dispatching a long ball for his first Bundesliga goal in what was his 20th appearance. Ulreich promptly had to pull off another save to a Johannes Flum thunderbolt as Stuttgart endured a late dose of the shakes, but after three minutes of added time, the points were theirs.